Schweitzer returned to Lambaréné in 1924 and except for relatively short periods of time, spent the remainder of his life there. With the funds earned from his own royalties and personal appearance fees and with those donated from all parts of the world, he expanded the hospital to seventy buildings which by the early 1960’s could take care of over 500 patients in residence at any one time. 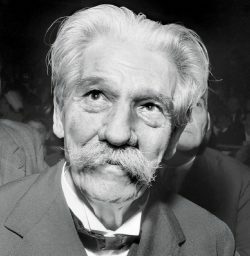 Albert Schweitzer died on September 4, 1965, and was buried at Lambaréné (Western Gabon, Africa).